The needs of your digital devices will be taken care by Xtus E50 . Ergonomic design and fits nicely in your hand. Perfect combination of inspiration and design, Xtus E50’s sleek curves are nice to your touch. Intelligent USB ports which automatic identify output requirements and regulates discharge currents. 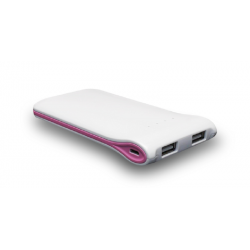 It charges your devices optimally and protects it at the same time . Multi-protections making it safe to use. It is designed with multi-protections that protect your devices from overcharge, over current and overvoltage giving your peace of mind.